The ultimate goal is to establish, develop, maintain, preserve and promote a long distance, public, non-motorized trail running north/south through the short grass prairies of the Great Plains of North America, resulting in a trail that runs from Canada’s Grassland National Park on the U.S./ Canada border to the summit of Guadalupe Peak in Guadalupe Mountains National Park, Texas. The trail will allow for hiking, horseback riding, and in most areas, mountain biking. Users of the trail can choose to travel a small section of the trail for a day, take a few days to see a larger portion of the trail, or even a whole adventurous season to travel the full length of the trail. The northern terminus of the Great Plains Trail (GPT) is on the U.S./Canada border adjacent to the western section of Canada’s Grasslands National Park. The GPT will pass through the 3,000,000+ acre American Prairie Reserve as well as the Charles M. Russell National Wildlife Refuge in eastern Montana. The GPT will take advantage of the forests and views provided by The Black Hills of South Dakota. Western Nebraska is dotted with pine forests, buttes, and badlands as well as the famous Scotts Bluff National Monument. The GPT bisects the visually dramatic Pawnee National Grassland in eastern Colorado. The GPT swings into western Kansas to view the stunning canyons of the Arikaree Breaks. Comanche National Grassland in southeastern Colorado contains abundant wildlife, an impressive canyon system, and ancient dinosaur tracks. The GPT will likely follow the Santa Fe National Historic Trail through parts of Kiowa National Grassland in northern New Mexico. The GPT will drift far enough west to catch glimpses of 10,000+ foot peaks in eastern New Mexico. Wherever the trail goes, to journey along it will be a worthwhile endeavor – be it 1,500 miles or 15 minutes. Adventure awaits! Excellent website. Your first blog post describes what South Dakotans call “West River” quite well — things change when you get west of the Missouri River. The remarkable nature of the prairies and plains have been overlooked by history and by our jetbabyjetpacks. The Walt Whitman quote states your case well. Let me know what I can do to help and I will continue to share the word with friends. Thanks Corey! I appreciate all of you support so far. I may have some tasks for you in the near future, but for now, let people know and tell them to post a comment here. We’ll talk soon. . .
Like the folks who have commented so far, I think you’ve got a great idea, and the trail will be a huge success. There are currently (that I know of) three north/south transcontinental trails, and they are all relatively mountainous, so a plains trail will be a welcome change. Anyway, thanks for advocating for more trails. I look forward to hearing more about the Great Plains Trail. I agree about allowing for bikes in as many areas as possible, and the more advocates I can get for this trail, the better chance of surmounting the considerable obstacles the trail faces (namely the preponderance of private property – the dreaded 3-p’s, if you will). Luckily, there is an initiative in Congress to allow for additional tax credits for conservation easements if the property is donated to a National Scenic or Historic Trail. Also, I’d suggest, as an interim step towards a true non-motorized trail, consider routing onto gravel and dirt roads. Very little traffic, rugged but maintained, and no property rights issues to worry about. Thanks for the ideas and the support! 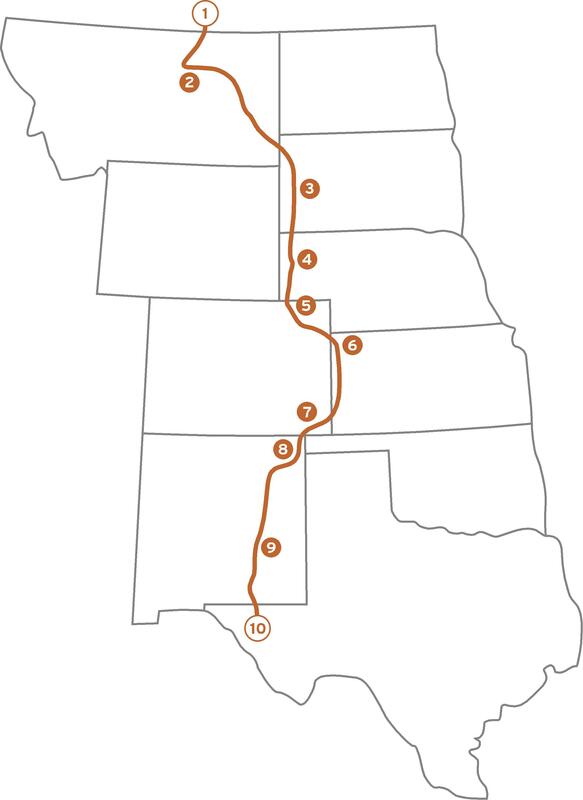 Western Kansas is high on the list of possible routes largely due the scenery of the Arikaree Breaks as well as the concept of the Buffalo Commons. I have definitely considered the dirt road idea as a way of bypassing the overwhelming private property obstacles. A proper trail could be placed on the scattered pieces of federal or other public land that currently exists with the idea of eventually connecting the dots. By the way, you have a great website, and I’m now following you on Twitter. Good luck and happy cycling! Sounds like a solid plan. We’re trying to keep roads to a minimum as much as possible, but I too am finding out that back roads can be just as enjoyable. There is some fantastic scenery out there on some very lightly traveled roads! Thanks for the blogroll link. Great Plains Trail was the subject of yesterday’s trails network blog. Check it out to see if I got the facts straight. I was going to contact you earlier, but it was so beautiful today, I went on not one, but three bike rides. I must be getting spring fever. It looks perfect, and thanks again for the mention. I too was out riding the concrete trails of Longmont yesterday. There were plenty of people out and about on this (relatively) new trail east of town. That’s the thing about trails, if you build it, they will come. Great idea! It’s too bad that the Grasslands NP start seems to rule out a link through the Maah Da Hey Trail in western ND, though. Maybe a spur? I’m a huge fan of Western North Dakota, and there is certainly room for discussion as to where the trail will ultimately go, but partially I was concerned about the explosion of oil drilling in that region, also with the commitment from the folks at American Prairie Foundation, Montana seemed like a better starting point. Thanks for your input! My concerns, as someone currently sectioning the Appalachian Trail at 100 miles per year, is access to trailheads using public transportation (Greyhound, AmTrack). Hikers need access to public transport about every 100 miles. I’m have enough trouble planning how to get to and from the AT even though it passes through the most populated part of the USA. Private shuttles are costly at $2 per mile (10 miles = $20). Another concern is resupply. One can only carry so much weight. What small towns will the trail pass through or within 2-3 miles of that hikers can use to purchase food or pickup a maildrop? Finally, hikers need access to showers and overnight accomodations (campgrounds, hostels, motels). Even the hardiest hikers take a “zero” and sleep in a bed, clean up, eat out, watch a movie, and access a public computer to communicate with family. How are those needs being accomodated. Hope future posts will address these concerns. Thanks for bringing up these concerns. Your points are well taken. At this time, the intention is to begin with shorter sections of the trail where they might be most feasible. These sections will lend themselves to a more “day-hiker” approach. As interest increases, we will “connect the dots” to form a more continuous trail where “thru-hiking” is possible. As a plan develops to create these longer sections, a parallel plan will also need to be developed to address the very concerns you have raised. Trailheads that begin/end at the outskirts of small towns may be one approach. These towns could be used for grocery/water re-ups or for mail drops. In longer sections where towns are more sparse, cabins or huts might be erected. That would, of course, require a way to maintain them or even staff them. All of these issues are, for the moment, down the road, but are very exciting to think about as the trail develops. The first step is to create a network of shorter sections across the whole scope of the trail. Thanks for your interest in the Great Plains Trail, and good luck with your AT experience! Good points and thoughtful response. Does anyone know what share of hikers (on AT, PCT, CDT) attack it by sections? I’m guessing that section hikers are the norm. If that’s right, then designing by sections of 50-100 miles would work. I suspect water will be the biggest logistical challenge. I know of some people who have attacked the long trails all at once, but I imagine many more go about it as time/money allows. Agreed that water is a primary concern for anyone going for more than a day or two. Getting supplies in towns is only a partial solution. There needs to be a way in more desolate sections for people to obtain water. Mountain long trails can rely on streams and snow melt, but not so much on the plains. Some sort of cache system at known intervals is one possible idea. I’m certainly open to any others . . .
You need to plan for water for day hikers or post warning signs. I’m always amazed how many people walk away from their vehicles without water or even any essentials should they become disabled in the wildness. One mis-step can equal a long cold, hungry, thirsty night. I’ve been involved in more than one SAR call to rescue day hikers long after dark. Thanks for that information. I would’ve guessed the thru-hiker percentage to be somewhat smaller than that. Interesting. Your thoughts about water have been at the forefront of my thinking for the past few days. I’ve considered several of the options you list above. All possibilities. There are also a number of smaller state parks/county parks along the proposed route that have lakes or pumps, and could serve as a source of potable water on the longer stretches between towns. Thanks for checking back in, and as the trail becomes a reality, these are just the kind of issues we will need to address and plan for. I should know, I’ve been in trouble a few times myself out there . . .
I’m planning the first southbound thru-hikes of the Great Eastern Trail with my hiking partner this year, which will be the third and fourth GET thru-hikes overall if succesful. Learning about this proposed trail from a fellow Appalachian Trail thru-hiker is very intriguing. I know I want to hike the Pacific Crest Trail and Continental Divide Trail and many other routes, but the idea of hiking something less traveled or entirely new is an exciting idea. I need to put plenty of energy to mapping and building a guide for my route this year and I shouldn’t spread myself thin, but I’d be keen on taking a closer look at this route at some point. I used to be a cartographer, and it is much more exciting to bring my skills to bear on mapping trails than on mapping New Jersey roads! Sounds like you’ve got quite an adventure ahead of you. We’re trying to stay as much on trails as possible, but much of it will also have to be on roads. Right now we have about 1000 miles left to fully figure out, so it will be a few years before any detailed map is available. Agreed. It’s an enjoyable process for sure! I just found out about this project via a link on Facebook. Love it!! I’ll share on my SCB Citizen blog. Awesome . . . and thanks!